How is the Takamine guitar advert effective? How is the Takamine guitar advert effective? 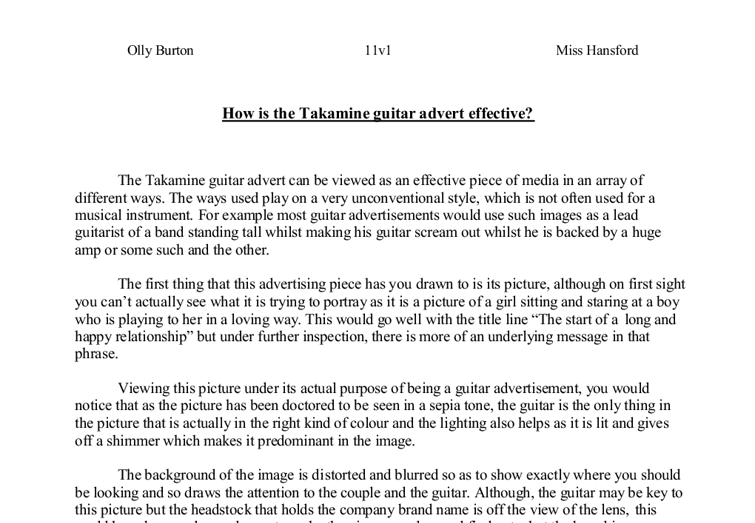 The Takamine guitar advert can be viewed as an effective piece of media in an array of different ways. The ways used play on a very unconventional style, which is not often used for a musical instrument. For example most guitar advertisements would use such images as a lead guitarist of a band standing tall whilst making his guitar scream out whilst he is backed by a huge amp or some such and the other. The first thing that this advertising piece has you drawn to is its picture, although on first sight you can't actually see what it is trying to portray as it is a picture of a girl sitting and staring at a boy who is playing to her in a loving way. This would go well with the title line "The start of a long and happy relationship" but under further inspection, there is more of an underlying message in that phrase. ...read more. It is always an awfully easy thing to sell a guitar over any other instrument as it is a very glamorous instrument (unlike a bass) and so the people used are also very young and attractive in themselves. This gives a sense of youth to the company and would make them much more appealing to a buyer, especially a first time buyer. Now onto the text: the text used in this piece is very peculiar indeed and for the most of it the idea of the guitar has shifted onto that of a partnering agency. Many of the words used such as "partner", "right for you" and "wonderful" cast up totally different thoughts from that of a guitar and this is where the adverts key selling point really delivers. It leads on in such a way that you must read on to understand what is actually going on in the advert and leaves you in ...read more. Also the writing is done in ways where the name "Takamine" is done in black and so stands out from the very beige and bland background contrast. The advertisement does the very clever thing of having a send off line saying how the Takamine guitar will always be there and telling you to "Go find one". This uses the same principles as adverts use when they say "Buy Now" and it has been proven to work in a very large amount of cases. It also leaves you with a website if you are really interested in the guitar and also a phone line to call and order a brochure of all the different types of guitar they have on offer which also shows them to be very professional which adds to their selling power. 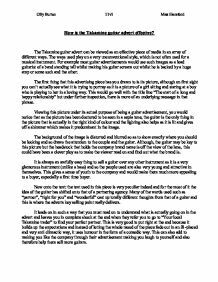 All in all, the "Takamine" guitar advert is a clever piece of media and would prove quite effective at selling itself due to its strange style and odd selling point. ?? ?? ?? ?? Olly Burton 11v1 Miss Hansford ...read more. This is because the adults would have to have a regular income or spare money to donate and would understand the problem where as children would not. Sight Savers charity is not very professional compared to Christian Aid. It does not have a logo, or a donating slip on the advert. The problems with questionnaires are that sometimes not all of them are returned so can be very inconvenient, some are not completed or others don't answer the questions required. I will give out my questionnaires out to anyone I know.